I cannot believe the mail the postman brought me today. I’m seriously floored. This amazing baby gift just arrived from Josie. Her note says “I’m not sure that this one will be good enough to make it on to the wall but I hope you like it anyway.” Um, yeah!! It’s gorgeous! Just look at it! It’s putting my raggedy quickie specials to shame. 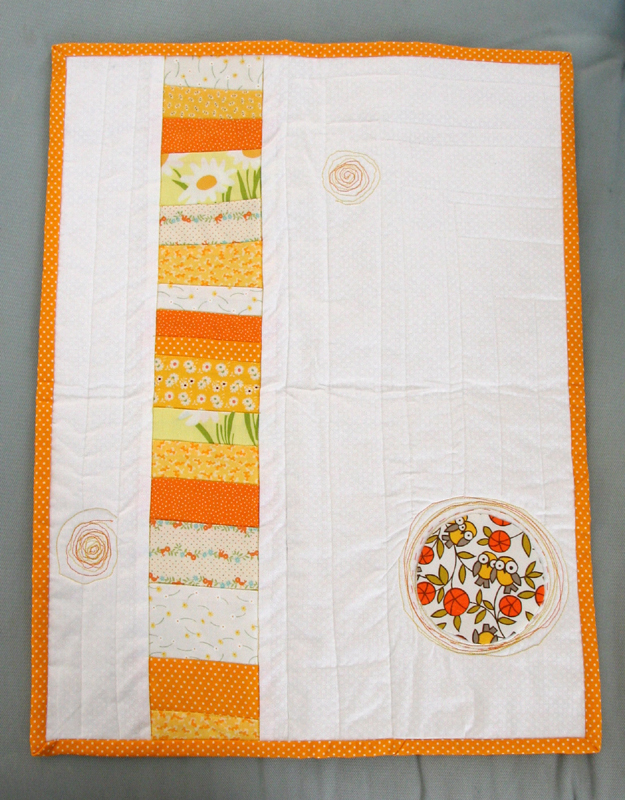 The colors are perfect and the fabrics so cute and I just love the stitchy circles. AND she knit these little booties! They’re so sweet. Have I mentioned I’ve already pulled apart two attempts at making booties since being pregnant. I’d given up hope and now I have a perfect little yellow pair. And she also made this little bib that matches this cutie gymboree onesie. gah! I love it all. As if that wasn’t enough, she sent japanese fabric too!!! I don’t even know what to say. I’m so touched. I’m constantly amazed at how warm and generous people I’ve met through the blogging are. I’m feeling more than a little bit guilty to be receiving such a beautiful present. Of course I’m feeling that guilt through the happy dance I’m doing all over the apartment with my new treasures. Wow — that is one fine package! Everything is just so pretty. Wow. Such friends! The quilt is great and I noticed the “sketched” circles too. Love that detail. That is so generous and so, well, awesome! I love that quilt! Seriously everything about it is so great! What a sweet lady! The quilt is too cute! Amazing colors. I love the fabrics. Does anyone know where to get the on e with the girl in the red hat and hte ducky? Thank you so much for your thanks. I am so pleased you like it, I really did love making it. There is a bit of a repeat on my blog too because I guess I wasn’t expecting you to like it so much. What a perfect gift! Love the little quilt. Lucky you! The quilt is just adorable. Lucky mama- that quilt wall will be amazing. What thought and love has gone into these generous and gorgeous gifts! Wow! What a wonderful, delightful, generous gift. Thanks for sharing your good fortune with us. Wow! That is some seriously good stuff!!! That quilt is FANTASTIC! The booties are so adorable. Come on junebaby. We want to see them on you!! That is one fantastically pretty package! I’ve always wanted to make the pattern for those booties. And that fabric, wow. And of course the quilt, what a wonderful package. So glad to see you spoiled!! Oh what a great gift, I love the orange, who would have thought a person could make orange look so good!! Yay! They’re beautiful – every bit. That has to be the best mail delivery EVER! That quilt is so fantastic. I want one my size! what a sweet,sweet package!! so jealous. 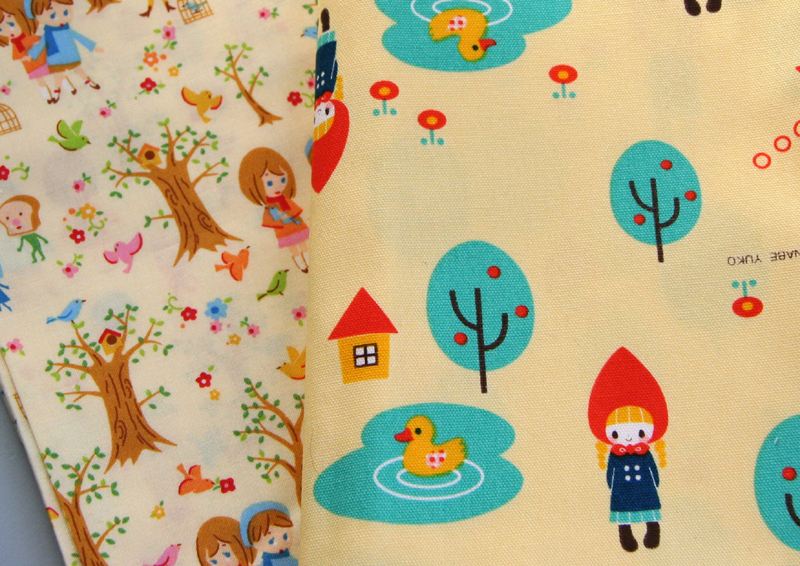 everything is made beautifully and the fabrics are darling. lucky lady! absolutely adorable… everything is just so sweet. what a fabulous present. 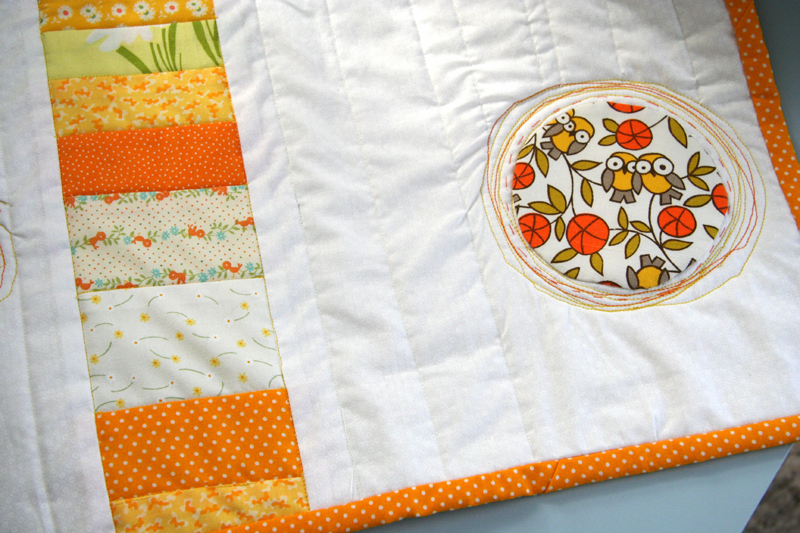 I love the circles on the quilt! Oh, wow. Wonderful stuff. What a lovely gift! Wow! What a thoughtful present! That little quilt is fabulous – Josie is extremely talented. And the booties! Everything is so sweet. How absolutely sweet. I am feeling a little baby crazy just looking at the pictures. My ovaries are craving some little quilts and booties. I LOVE the blanket! That is so great! My mom and I just got a stash of vintage quilt blocks and strips, and this would be a great use for the strips! What a beautiful quilt. The fabric is just too cute. I love the colors and the booties are to die for. Congratulations!! what a beautiful gift! the colors are wonderful! Everything is just gorgeous, and I love the booties, and the embroidered tshirt too. Yellow is such a nice color for a babies room, and its not that pastel lemon either. I am sure your baby will look extra cute in those pressies. Junebaby is one very lucky baby! What an adorable package. So lovely! And I think talking about the weather is a Midwest affliction. It’s how we get through the winters.